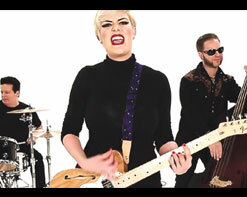 We last rocked out to bree in early 2014 with her exceptional video for “I’m The Boss” (which has been nominated for Indie Ville TV’s Video Of The Year). Since then she has given herself a striking makeover that we are totally on board with while still giving us everything we’ve loved about her since day 1, trading in her brunette locks for a pixie cropped blonde hair. Her looks are like her music, throw any style her way and she will own it with authority. On her new single “Damn, I’m Being Me Again,” she gives us one of her fiercest offerings yet. In the fall of 2015 bree began recording at Ronnie’s Place Studio in Nashville with Justin Cortelyou (engineer for iconic producer Bob Ezrin), and come May we’ll have a chance to indulge in the fruits of her labor. The album is titled New Skin, and the first taste is “Damn, I’m Being Me Again,” which hits like a sledgehammer to the ears, but at it’s core the song is a genuine piece of self-awareness and introspection. As she sings about her own shortcomings, she’s quick to admit she’s perfectly imperfect and own up to it. For a girl with a long, sometimes complicated journey from growing up in a religious cult in Oregon to making her way to Nashville and being named RAW Nasvhille’s Musician of the Year, she has come by who she is as honestly as possible. These life experiences and the ability to put them to song have made her a fan favorite, not only stateside but also abroad in the UK, where she just returned from a wildly successful jaunt. For the new video, bree has taken the same approach for the visual as she does for her music. No frills. No gimmicks. Just unabashed rocking chock full of attitude and energy. She is accompanied on the all-white soundstage by powerhouse drummer David Castello and upright bassist Mayrk McNeely, formerly of The Eskimo Brothers. With nothing more than their instruments at hand, the trio rips through a blistering take of the song. It’s hard to imagine that three people could create such a massive wall of sound, but bree is one artist who we’ve learned to never doubt when it comes to delivering the goods! We’re very excited to be working with bree and her team at Werewolf Tunes to bring you this dynamic clip. If you need anything at all from our end to get this into your programming, please don’t hesitate to get in touch. If you need more info, contact Andy Gesner and the HIP Video Promo crew at (732)-613-1779 or email us at info@HIPVideoPromo.com . You can also visit http://www.WerewolfTunes.com/ or .